Civil engineering is poised to undergo major transition in 2018; thanks to the advancement in technology which is the driving force behind the changes this industry will witness. Some of the latest technologies we cover in this write-up which were once dubbed sci-fi have already begun finding a way into the mainstream industry. Since the last decade, the focus remained on smart materials and energy-efficient buildings. But, in recent times, civil engineers are placing more emphasis on computer vision, BIM, virtual reality, sustainability, IoT, and 3D printing technologies that are parallelly gaining prominence. In this write-up, we provide a mash-up of latest developments in civil engineering that are becoming latest trends. Virtual Reality (VR) and Augmented Reality (AR) are the newest trends in civil engineering to watch out for in 2018. Although the technology itself isn't new, its applicability vis-a-vis civil and construction industry is gaining immense popularity. VR and AR are forms of immersive media to visualize the end results and are increasingly being used by both end users and the civil engineering project teams alike. Virtual Reality is empowering the civil engineering industry with a user experience that was once possible only in science fiction! Stakeholders and designers can benefit from the interactive and immersive experience in an isolated ambiance created using sophisticated VR headsets, cardboard viewers, etc. After all, who wouldn't appreciate the virtual experience of stepping into planned constructions even before the implementation? Augmented Reality on the other hand interweaves real-world and graphics to give field personnel and civil engineers useful information such as health and safety warnings, productivity statistics, design specifications, etc., making their job on field easy. This is just the beginning, and the applications of VR and AR technologies are expected to broaden way beyond expected in 2018 and the years ahead, making them the backbone of numerous civil and construction projects. More civil engineering projects this year are likely to see large-scale utilization of the Cloud technology and Big Data. Also, latest in the list of innovation is the Building Information Modeling (BIM). Engineers can now create virtual models of their designs through intelligent 3D modeling process. This futuristic technology can speed up the time taken to turn building drawings into reality. Construction of bridges, electricity networks, and superstructures can gain momentum with workable virtual models of the designs. As BIM and 3D modeling provide engineers a chance to visualize completed designs at the onset, the design process is poised to be cost-efficient and more streamlined in the future. Sustainable design is the most significant civil engineering trends in 2018. It is a movement that enjoys much support from global organizations and even the government. The demand for smart materials, intelligent electrical grids, smart buildings with embedded sensors, and other revolutionary technologies is giving civil engineers the push to innovate sustainable designs that are forward-looking. One of the key areas of focus is zero-energy housing. Insulating homes with double skin facade and integrating PV panels that facilitate better utilization of captured energy. As space is a major concern with the explosive population growth, smart use of space in housing which can ease the congestion and pave way for sustainable urban development is also a key trend that will find wider acceptance this year and the years ahead. Drone market has seen a sturdy growth in 2017. The trend is expected to continue even this year and sales of drones is likely to exceed $12 billion by 2021! Commercial use of drones has reached an important milestone with technological enhancements making drones more reliable than before. Drones are steadily making its presence felt in in civil engineering industry, greatly influencing the design, development, and surveying of civil engineering projects. Drones are instrumental in carrying out safety inspections along with progress reporting. Drones effortlessly access hazardous sections of the construction and collect data from large areas in a matter of minutes. This technology has allowed surveyors to get the job done without risking life and limb. In 2018 and beyond, drones are expected to become part of mainstream civil engineering. However, regulation of drone technology is hotly debated due to its fast-paced evolution and its affordability to the mass market. Advanced materials with shifting properties that adapt to external conditions are being introduced into the civil engineering industry. From cement composite, advanced steel, and self-healing concrete, to fiber-reinforced polymer composites, technology is transforming the materials being used in construction. In 2017, Pavegen, a UK-based technology company outfitted sidewalk in London with innovative technology that harvests kinetic energy from pedestrian movement and turns it into usable energy. This project highlights the need for smart materials to trap and utilize energy which is otherwise wasted. Similarly, 4D-printed structures that transform according to the shifting environmental conditions are the latest fad in civil engineering because they prolong the life of constructions. Buildings in major cities around the world are coated with photocatalytic titanium dioxide to combat pollutants in the air. In the long-term, it will mitigate human-induced environmental hazards. The civil engineering design of the future is all about advanced materials that are largely focused on reducing carbon footprints and harnessing the energy that our planet has to offer. Internet of Things (IoT) is a megatrend which is quickly reshaping the way in which civil engineering projects are implemented. In a nutshell, IoT leverages sensors and network connectivity to allow communication between the interconnected sensors. The sheer volume of data being exchanged is collected and analyzed to enhance future decisions. IoT will play a leading role in monitoring the health of urban structures by pooling big data from the building management system. It will be capable of recording data such as variations in concrete humidity, vibrations, chloride content, and even abnormal deformations. The lengthy list of things IoT can achieve is gradually growing thanks to cheap wireless sensors. It is one of the latest upcoming trends that will give rise to smart cities and improve the quality of life of its inhabitants. The year 2017 witnessed a surge in the demand for 3D Printing across various domains. In 2018, this revolution has reached construction and civil engineering industry in a big way. 3D printing can turn engineering designs into scale models or even real components required for building construction. This technology, currently in the advanced stage is ready to take on more complex civil engineering challenges involving full-sized homes and bridges. Scientists are contemplating the use of 3D printing for assisting humanity's efforts to colonize Mars. Without doubt, this is one of the most exciting upcoming trends in civil engineering. Robots in the construction industry are taking over tasks that are hazardous to humans. It not only improves worker safety and productivity but also saves costs in the long run. Last year, civil engineering industry tasted success with many iterations of bricklaying robots that illustrated efficiency by building walls six times faster than human workers! However, the immediate challenge with Robotics is its initial cost, feasibility of mass application, and reliability. Said that, with continuous improvements in the Robotic technology, we can expect to see robots taking over the mundane tasks in construction and civil engineering in the future. Outsource2india is a leading engineering service outsourcing company with 20 years of quantitative and qualitative experience in serving clients all over the world. Outsourcing your civil engineering services to us can help you avail numerous benefits that include not just affordable costs and profitable ROI, but also unmatched domain expertise and technological know-how. With deep domain experience and experienced engineers, we can deliver your engineering projects with utmost care and precision straight from our world-class delivery centers or as an extension of your in-house team. 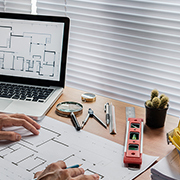 At O2I, we also offer diverse civil engineering services such as Terrain Modeling Services, MEP Design & Drafting Services, Paper to CAD Conversion Services, and more that can help you achieve promising results. Get in touch with us and start an enterprising journey to success.